Green Energy Options provides Energy Audits, Energy Efficiency Consulting and Building Performance Contracting for Gainesville, Alachua, High Springs, Micanopy, Ocala, Jacksonville, and Tampa, Florida. We provide our services for homes, businesses and multifamily residences. Our mission is to help you create the healthy, comfortable, and energy-efficient home or business you desire. If you have high energy bills, drafty or uncomfortable rooms or indoor air quality issues, we can help. A professional energy diagnostic is the first step to correcting these problems. As energy prices continue to rise, reducing your utility bills is something you can do now. Your return on investment for energy efficiency will only get better. Energy conservation and efficiency measures are the cheapest, cleanest, and safest sources of energy you can choose. Even if your end goal is a solar-powered building, efficiency upgrades should come first. A tighter, more efficient building can allow you to install smaller heating/cooling and solar systems. Whether you want to make incremental changes or undertake a “deep retrofit”, we can guide you. We can take you from the first step – developing a prioritized plan, to the final step – enjoying the completion of energy upgrades that can save 20-50% on your energy bills. As a building performance contractor we work with a variety of trusted specialists who will do the work as specified in our Comprehensive Energy Analysis report. We coordinate the work and ensure the final quality by inspecting and post testing measures such as air sealing, duct sealing, insulation and combustion safety. 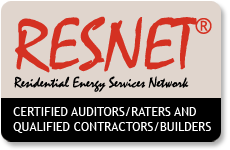 Our Comprehensive Energy Analysis goes well beyond what you may have encountered as an energy audit often provided free by a utility. We use state of the art testing equipment to identify energy waste and potential savings, check the safety of your gas appliances, and to help improve the efficiency of heating and air conditioning systems. Our "building as a system" approach ensures that resolving one problem will not make another worse. Once we have completed our analysis, we provide you with a customized report that prioritizes what must be done for health and safety and what should be done for energy savings. We stress educating you about the things you can do on your own. If any recommended attic or duct sealing, or gas appliance repair is done, we return and retest afterwards to ensure that the work was performed correctly. Green Energy Options is located in Gainesville, Florida and provides Home Energy Analyses to Gainesville, Alachua, High Springs, Micanopy, Ocala, & all surrounding communities.